Soaks getting the hang of tracking! Humans have been utilising dogs’ incredible sense of smell for different purposes for hundreds of years. From hunting game, to searching for missing people, drug and explosive detection and even for locating truffles, with the right training, dogs are much better detectors for many things than anything modern technology has produced. And it’s no wonder – with a sense of smell between a thousand and 10 million times better than ours depending on the dogs’ breed, scent is their most powerful and dependable sense..
ANKC tracking was developed to test this sense, attempting to mimic a situation where a person has gone missing and the dog has been engaged to find them. Track layers are given a map and directions to follow and articles (usually socks or other items of clothing) covered with their scent to drop along the track. At each of the articles, dogs should “position or otherwise indicate” to show the handler that they have found the article. As with most sports, different states have different interpretations of the rules so check with your local tracking club to see what is acceptable in your state. In NSW, indicating an article involves the dog having to hold a position (a sit, drop or stand) until the handler is able to retrieve the item from the ground. Once the handler is holding the item, they would instruct the dog to track again, and allow the dog to track out in front, up to the full extension of the tracking lead (10m). In other states, a nose touch over the article before continuing is accepted. 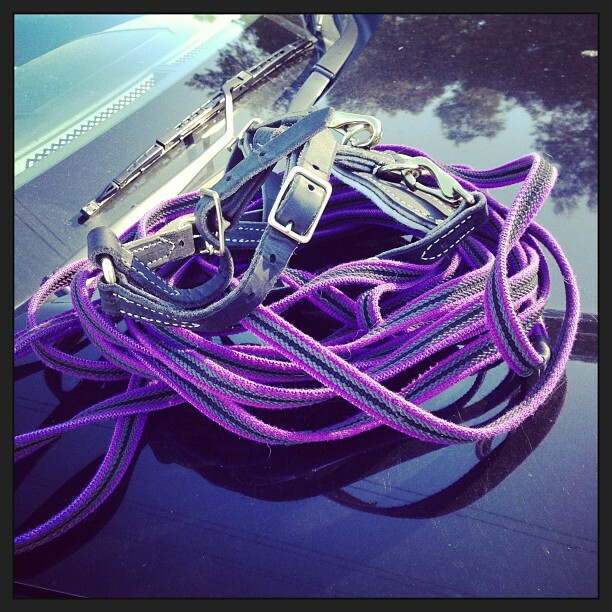 Tracking Dog (TD) Classes – passing all three tracks qualifies the dog to use the Tracking dog or TD title. Test 1 – the dogs must track someone they know for approximately 400 metres. The track itself will have 2 changes of direction of somewhere between 90 and 150 degrees with the first change of direction a minimum of 100 metres after the start. There will be one article dropped on the track by the track layer, however the dog does not need to indicate the article to gain a pass. The track is laid between 20 and 45 minutes before the dog starts so there is plenty of fresh scent for the dog to find. The track layer themselves or an article placed by the track later must be found at the end of the track for the dog to pass test 1. Test 2 – the dogs must again track someone they know, however now the track increases in length to 800 metres and is laid between 30 and 60 minutes before the dog starts. There are two changes of direction of between 90 & 150 degrees and two articles will be dropped by the track later. The dog must indicate at least one of them (with either a sit, drop or stand) as well as find the finish article, or the track layer at the end of the track to pass. Tracking Dog Excellent (TDX) Classes - passing all three tracks qualifies the dog to use the Tracking Dog Excellent or TDX title. Test 4 – The dogs must track an unknown person for roughly 1km with 4 changed in direction (90-150 degrees). The track will have 3 articles placed on it and the dog must indicate at least two of them to pass, as well as finding the track layer or finish article at the end. The track is allowed to age for longer than in the past, being laid between an hour and two hours before the dog is allowed to start. Test 5 – Track 5 is very similar to track 4 however this time, the track is crossed twice by another person or two other people. The dog must discriminate between the scents and remain on the original track’s scent. The cross tracks are laid about half an hour after the track the dog is supposed to follow so they are fresher and easier for the dog to find – following them though results in failing the track. Test 6 – Track 6 gets harder again, with the dog required to track an unknown person for 1.2kms. The track has a minimum of 5 changes of direction, one of which is between 45-90degrees and the other changes of between 90-150 degrees. Three articles are dropped along the track, two of which must be indicated by the dog (as well as the finish article or tracklayer at the end) and the track is crossed twice by cross tracks laid by one or two other people 30 minutes after the original track is laid. The track the dog must follow is laid between an hour and three hours before the dog is allowed to start. Tracking Champion (TCh) Classes. 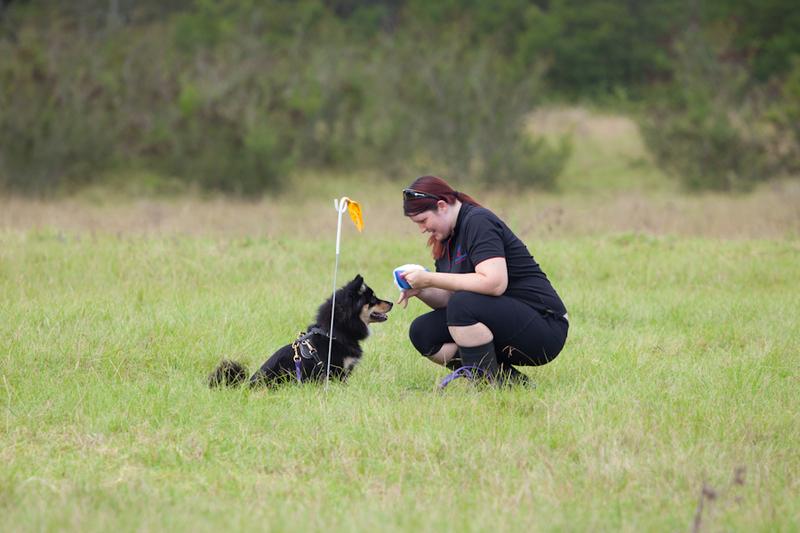 Passing both tests qualifies the dog to use the Tracking Champion or TCh title. Test 7 & 8 – While test 7 and 8 are identical, they require a much higher level of work because the dog needs to find the start of the track somewhere between two widely spaced flags. In the previous tests, the start is marked by a flag and an article so this is a big change for the dog. The start must be a minimum of 30 metres from any permanent barriers or fences, with a two small marking flags spaced some distance from one another. The track layer will place one article in a sealed bag and place it more than 30 metres from these flags. Once the track has aged for between 1.5-3 hours, the judge will take the handler to the article in the bag where the handler will give the article to the dog to smell. The dog must then search for the scent between the two start flags and begin tracking. The dog must track an unknown person for 1.2kms with at least 6 changes of direction, two of which must be between 45-90 degrees and the rest being between 90-150 degrees. The first change of direction must be more than 100 metres from the start. Three articles are dropped along the track and at least 2 must be indicated by the dog to pass. Two cross tracks by one or two different people will also be laid 30 minutes after the original track and the dog must find the track layer or finish article.